Okay, so I have recently discovered the best lip balm EVER, and I have to share!! I have been a lip balm connoisseur since the first time I went to the Body Shop in grade 6, and I feel like I have tried all lip balms out there. I have found ones that I like, and others that made my lips chapped (?! ), and now I have found my very fave. It’s Hurraw! 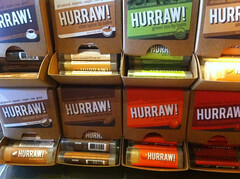 Hurraw is a all natural organic vegan/raw lip balm company, which uses the finest ingredients in their products. Their flavours are so much fun, I need to try them all 🙂 Right now I am using their cinnamon flavour, and have also ordered the lime, vanilla and chocolate! Yum! These lip balms glide on your lips like silk, you really don’t wanna stop the application it feels so good! lol Not only are their flavours fun and exciting, the tube is oval shape, which fits the lip better. If you are looking for an all natural lip balm, or a nice stocking stuffer for x-mas, these will be a real treat for anyone’s lip!